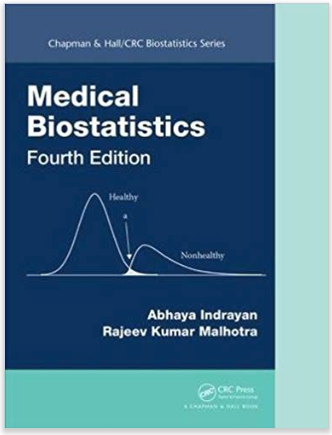 Medical Biostatistics (IV edition) looks like the most comprehensive book on biostatistics. All the topics of medical statistics are widely covered by the authors and the explanations are provided in non-mathematical easy language conducive to medical professionals. The book is a treasure tower for practicing medical statisticians, epidemiologists, clinicians and medical researchers of all disciplines. The first author of the book, Dr Indrayan, is just about the best known biostatistician of the country. The book consists of 21 chapters, which are well demarcated and segregated from each other.Each section deals with a specific biostatistical topic. Each topic is again divided to various subheadings which intern divided into specific topic. Each chapter has provided a list of references which could be useful for further reading.The exercises at the end of each chapter arethought-provokingand comprise questions that could also be useful for PG entrance exams as well as for UG/PG exams. Initial few chapters are very useful for biomedical researchers as they deal with various types of study designs with many examples, and how to choose appropriate study designs is also discussed. The advance topics are a good reference guide for biostatisticians. A check list on prerequisite of various study designs are also incorporated for giving concise overview of the study designs. Separate chapters are given for various study designs such as for observational study, experimental study, and clinical trials. The details are elaboration of basic design concept, enrolment of subjects, analysis of data, its merits and demerits, and potential bias in that particular design. The chapteron clinical trials discusses therapeutic trials and non-therapeutic trials separately considering the aspect of how to do allocation of the subjects in clinical trial, designs with interim appraisal and reporting of trials. Elaborate methods of qualitative assessment of clinical trials are also a unique feature of this book. Probability concept is given with practical orientation of medical problems. Diagnostic tests and validation techniques are also described in details along with utilization of combination of tests.Survivals analysis and other multivariate analysis methods, which are generallynot covered by most other biostatistics books, are also explained in this volumein a simple language along with modelling approaches. Statistical quality control method in medical care and risk of bias, quality of data issues aredealt appropriately. A unique feature of the book is a full chapter on statistical fallacies which deals with underuse, overuse and misuse of statistical methods in medical literature and related misconceptions.This chapter nicely explains about interpretation of data and also what test to apply in a particular situation.Brief notes about statistical software are given in appendix with illustration of avariety of problems with the popular package called R.
This book is invaluable to every medical college library and other departments that are active in research and its reporting.